1. 2-6 weeks before start your topicals including: Retinol Plus Smoothing Serum 10x, Rebrightalyze Kit (Kojic Acid), Hydrocortisone 1%. 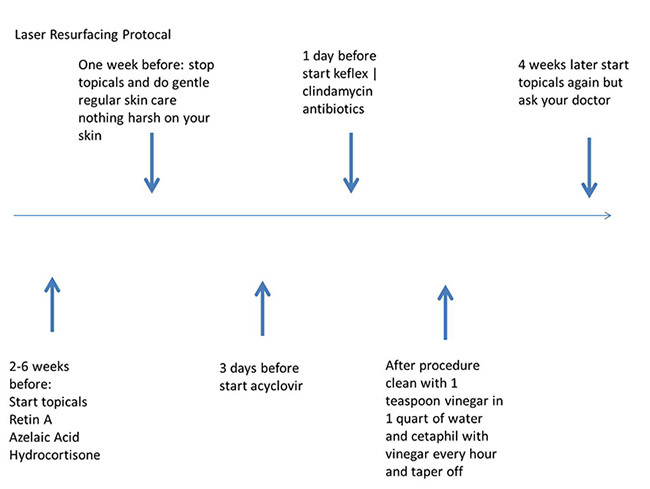 Here is a link for a more in-depth explanation on Laser Resurfacing Topical Preparation. 2. 1 week before stop these topicals and start doing gentle skin care: 1.) Our Aesthetic Facial Body Plastic Surgery Brand Triple Antioxidant Moisturizing Cream with Resveratrol, Caffeine and Green Tea Polyphenols or our Gentle Green Tea Antioxidant Moisturizing Lotion; 2.) and Our Aesthetic Facial Body Plastic Surgery Brand of Gentle Facial Cleanser with Green Tea Polyphenols, Emblica and Bisabolol. 5. After your procedure immediately start your cleaning regime and do it every hour until it is cleared of crusting and slow down to a interval that allows you to keep the crusts off your lasered areas. This includes Our Aesthetic Facial Body Plastic Surgery Brand of Gentle Facial Cleanser and vinegar and water rinsing (1 teaspoon of vinegar to 1 quart of water). White clear vinegar at a regular grocery store will suffice. 6. 4 weeks later start your topicals again but ask your doctor first before doing this.